Seriously, I love the album Some Nights by FUN. But some nights, for us, unfortunate, are NO FUN. Firstly, I’ve been noticing that at bedtimes, Z likes to stretch out the time it takes for us to leave his room. On the way out, just as I have one leg ready to hop over the gate (yes, we put a gate in front of his room to prevent him from coming to our room too early and force him to stay in bed till 7am. He has fallen back asleep a couple of times.). “ma…ma, ..”. And it’s usually nothing important. Tonight, at 15 minutes to 8, he announced that he needed to poo. So we grab the Diego potty seat from downstairs and plop him on. V is asleep already at this time. I go to the basement to deal with laundry. Then I hear M yell for me. V is up. So I go to Z a d he goes to her. Turns out, no poo at all. By the time he fell asleep it is well after 8:00. Too late (in my books at least). I emerge from his room to still hear V fighting and screaming for me. So I go in her room, scoop her up and bring her to our bed. I nurse her. She fusses but falls asleep eventuAlly. And he’s up already? I look over and M Is already in his room with him. I go in and take over since all he wanted was me after all. I pick him up. (i hear V cry and scream as M picks he up and tries to put her back to sleep. Silence. I feel better. Back to Z.). His face is drenched with tears and he is very upset. I sit on the couch with him and ask him to use his words to tell me why he is crying. No luck. I just hold him and he finally calms down. I stand and sing to him. Then gently put him back in the crib and sing him another song. He falls asleep even before I get to the middle of the song. I walk out and go brush my teeth and remove my contacts. I’m exhausted. 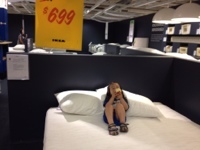 Our family loves IKEA. Really, who doesn’t? Z, V and I decided to spend the morning at IKEA just having fun. I let Z walk on his own while I wore V in the Ergo Baby. I still took the stroller so that I could nap V before we got into the car to go home. Our first stop was the kids section. It was fairly quiet, since it was only 20 min after 10. I let V out to play on the floor and she loved it. Z had so much fun with those blowup cushions. We were smacking one side of it and launching the fox stuffies into the air and he thought it was the most hilarious thing! Around 10:40, Z declared he was hungry. Part of it was because he saw the cafeteria, which was in front of the kids section. I had to explain to him that it was too early and they weren’t serving lunch yet. So we went and walked around some more. I offered him a cheese stick, to which he politely declined. Then I took out an apple and offered it to him and he happily took it. At this time we were in the beds section and he climbed onto one, settled in and enjoyed his apple. At nine months, Vs development has suddenly exploded. She’s crawling, pushing to sit up from her tummy, pulling up to stand on her own and cruising between furnitures. She also lets go From whatever she’s holding on to. Language-wise, she knows wave, blow kiss, kiss and clap hands. V also will start doing the hand motion to Twinkle Twinkle when she hears the word twinkle. Then she claps after the song. For the last week, V has been telling us that she doesn’t want to sleep in her crib at all. She wakes up less than an hour after she goes in and opens her eyes as soon as I start to move to get up. The solution was to being her into our bed. When in our bed, she is so comfortable and content. She even turns to sleep on her side and then onto her tummy, where she stays for a while. I love being able to watch her face – so peaceful and content. So we don’t get to sprawl out on the bed and cuddle but it’s not forever. In fact as soon as we come back from our trip we are going to sleep train her. We’re also waiting for her to get her first tooth. 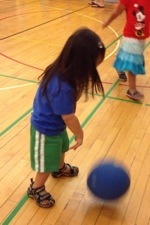 Today, Z showed some remarkable dribbling skills during fun time. I’m impressed with how he is able to dribble a ball before three! During bath time, M was looking at V through the shower glass and she leaned over and placed her face on the glass to kiss him. It was so cute. Lately V has been sleeping in our bed at an earlier time than usual. Tonight was no exception. She had a hard time falling asleep in the first place and woke up crying within the first hour. 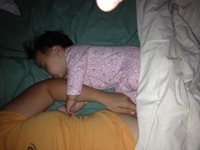 After two attempts at trying to resettle her in her crib, I just brought her into our bed. I nursed her to sleep, waited at least 10 minutes before going downstairs. Then I heard her cry 15 minutes later. So up I went again to nurse her. fter I detached, this is what she did. Funny, huh? 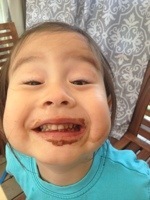 This is Z, after eating chocolate Ice cream. He usually does a dessert dance when he’s eating one. As much as it is work for me to wear V, I still love it. When I go back to work I’m going to miss it and the kids. After she wakes us, I sit on the couch to rest my back. Her favorite thing to do is lean her head on my chest. I love it. It makes me all warm and cozy inside. 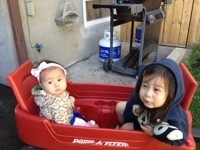 Today, instead of taking the double stroller, I put the kids in the Radio Flyer wagon. After almost 2 months of not visiting Roywood, we decided to go. It was a great idea because it was a nice change of pace for all if us. I think staying home was great but this was better. Big kids had fun and V got to nap there so she caught up on her sleep. Now she’s napping again. I don’t know why I never thought of using the wagon before. Weird afternoon. Both kids slept till after 4pm, pushing bedtime to past 7:30 pm. 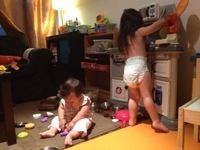 After dinner, which was in front of the tv, the kids played with the kitchen toys. V just really enjoys playing with Z, side by side. She loves him so much that she gets so excited every time she sees him. Today has been a busy day. We left strawberry picking around 12:45pm and drive home, hoping the kiddies would nap on the way back. Well, one of them did – V. Z stayed up playing games on the iTouch. By the time we got home, V woke up. Z was so cranky because he was so exhausted. He has been up since 5 am. We totally thought he’d be exhausted and conk out in the car. I had to sing to him 2 songs to help him fall asleep. It was minutes after 2pm when he finally fell asleep. He just woke up and it’s 4:25pm. I tried nursing V to sleep on our bed but she ended up just playing after she finished nursing. So I took her downstairs and wore her. She has been asleep since 3:15pm. She might wake now that Z is here. Today was a great day for strawberry picking. The weather was mild – not hot not cold And not too sunny. We met up with our friends, A and M and their 21 month old daughter. Z discovered that there was much joy to feeding the goats. At first he was hesitant and once he realized the goats didn’t bite he was eager to feed them. For ease, we left the stroller in the car. I wore V in the wrap and let Z walk. He didn’t even want to be carried at the end. It was a good idea to wear her because it’s good practice for when we travel to Amsterdam. She was happy the entire time and when it came time for her nap I just covered her and she went to sleep for 45 minutes.